An Introduction to Microwave Measurements has been written in a way that is different from many textbooks. As an instructor teaching a master’s-level course on microwave measurements, the author recognized that few of today’s graduate electrical engineering students are knowledgeable about microwave measurements beyond basic distributed circuit analysis. Written in a "how-it-works" spirit—strongly borrowing from instrument catalogs and application notes—this text covers a wide range of topics, clarifies many terms used widely on the subject, and equips the reader with the ability to grasp more advanced material. It starts with a brief overview of the basic theory and the building blocks required for understanding and using microwave measurement techniques. Oriented around the most commonly used instruments in microwave measurements—the network analyzer, the spectrum analyzer, and synthesized microwave source—it introduces the latest instruments and techniques and provides a brief description of traditional measurement techniques (slotted waveguide etc.). It offers an introduction to the mathematical basis behind microwave measurements as well as an overview of some of the practical components that are frequently used in microwave instruments. Observing that students generally grasp the subject better when actual numbers are given, rather than symbolic relations, the author includes examples involving numerical values that are scattered throughout the book. He also provides a detailed description of the vector network analyzer and the spectrum analyzer (explaining its principle of operation and calibration), which form the backbone of modern microwave measurements. In addition, he briefly addresses advanced topics such as pulsed measurements and non-linear network analysis. An Introduction to Microwave Measurements provides proficiency in subjects related to radio frequency (RF) and microwave systems, and is an ideal resource for senior undergraduate and first-year master’s-level students as well as professionals in the wireless industry who deal with such systems but are not specialists in the area. Ananjan Basu completed his BTech in Electrical engineering and MTech in Communication and Radar Engineering from IIT Delhi in 1991 and 1993, respectively, and his PhD in electrical engineering from the University of California, Los Angeles, in 1998. He has been employed at the Centre for Applied Research in Electronics, IIT Delhi as visiting faculty from 1999 to 2000, as assistant professor from 2000 to 2005, as associate professor from 2005 to 2012, and as professor from 2013. His specialization is in microwave and millimeter-wave component design and characterization. He has published more than 80 papers in journals and conferences. 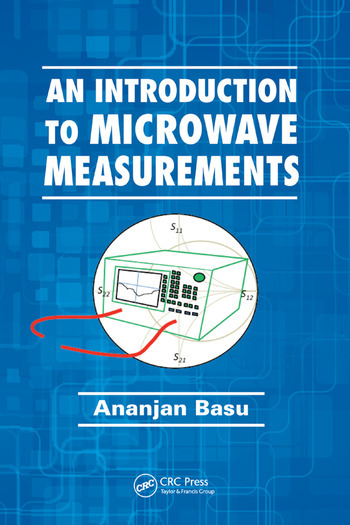 "... highly tutorial to help readers understand the fundamental basics in microwave measurements. Numerous equations derived step by step make the book adequate as a textbook. The examples and problem sets in each chapter offer a good chance for students to study and practice. ... [The text] has broad coverage of new updates to lift readers’ interest to an upper level. This is not commonly seen in other reference books for measurement techniques. For example, the chapter on vector network analyzers begins with the measurement of one-port scalar return loss, and then extends to two-port vector analysis. It explains the concept of calibration, and goes through the complicated mathematical formulations. Better yet, it touches on X-parameters in non-linear distortion characterization, newly introduced in recent IEEE papers. ... This book extends from the fundamental measurement theory to modern circuit characterization techniques. ... Students of little microwave engineering background shall be able to catch the concept without problem. Not only can they pick up the knowledge of what is inside the common microwave testing equipment, such as network analyzers, spectrum analyzers, and oscilloscopes, but also build up the ability to properly operate [the equipment]. This book is written to be quite readable. It can serve the purpose of self study as well. In my opinion, experienced microwave engineers can benefit from this book as a supplementary reference." "The topics explain microwave measurements using microwave instruments such as microwave network analyzer and spectrum analyzers etc. The book gives good mathematical background involved in measurement."